Here's a brief roundup of some of the recent texts covering the dissolving in the USA of privately-owned antiquities to get out papyrus fragments inside in order to be used in Christian apologetics (with the acquiescence of some US classicists which use the fragments for "research"). Research materials are provided from the massive Green Collection, one of the world's newest and largest collections [...] The first step in the research adventure was taken in April by Dr. Scott Carroll, director and principal investigator of the Green Collection research projects and a research professor of manuscript studies/biblical tradition in Baylor's ISR. Carroll -- surrounded by hushed students and other professors -- dissolved ancient Egyptian mummy coverings in a gentle dissolving bath. Discarded texts made of papyrus plants were recycled for coffins and death masks by moistening them, covering an embalmed body, then plastering, drying and painting the material. What emerged were more than 150 fragments of ancient papyri texts -- treasures including funerary texts, letters in Greek and in Coptic, a fourth-century A.D. (C.E.) Coptic Gospel text and fragments of classical writings by Greek authors. "As discoveries go, it won't get much more dramatic than this," Carroll said. 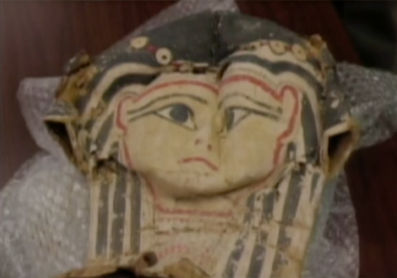 He also unearthed new texts from a dissolved mummy mask on Sept. 8, which have yet to be studied. Equally exciting was the discussion of mummy masks which the Green Collection has acquired. While the masks are interesting in themselves and of historical importance, some of these masks used ancient manuscripts retrieved from a scrap heap in Egypt in places like Oxyrhynchus to serve as the paper mache inner lining of the mask. Scott Carroll says they have found both early Biblical manuscripts and early classics manuscripts (a lost work of Aristotle, the earliest copy of some of Demosthenes etc.). If so, this is tremendously exciting. On any given occasion, somewhere around 5% of the texts are what we would call literary and the other 90-95% are documentary. They are letters, they are accounts, they are receipts, they are notes of one sort or another. All are important to tell us about the culture and societal background, but the literary texts are of greater value, so you find an assortment of those. [...] you may have Homer and the Bible and a love letter and an account, someone complaining about their taxes, all together in one mummy covering. They could range over several hundred years. It’s like a mini-excavation. 'Discover the Evidence' was an amazing event! The meetings on December 5-6, 2013 were unprecedented on a number of levels. [...] Each attendee actually participated in the extraction of papyri fragments from ancient artifacts. This had never been attempted with such a large group before. That was historic! [...] We uncovered both biblical and classical texts during Discover the Evidence. However, I found this particular video of an event organised by the University of the Nations for a workshop in Mexico last September 2013 a bit concerning. [...] he addresses the fascinating topic of papyri from mummy cartonnage. He jokes about the smell of mummy cartonnage over the house stove to the despair of his wife [...] Finally, he explains how to extract papyrus fragments from mummy cartonnage showing images from his computer. what you think 'might' be inside. Brice C. Jones, 'The 'First Century' Gospel of Mark, Josh McDowell, and Mummy Masks: What They All Have in Common', May 04, 2014. "To continue my posts about private collecting of historical artifacts, I provide below extracts from a video of Josh McDowell contains some highly disturbing comments and images. [...] In this video (posted below), McDowell explicitly explains his involvement in the deciphering of mummy masks, images of which Scott Carroll has also made public (see my last post on this here). McDowell is a Christian evangelical apologist with no scholarly credentials. He is perhaps best known for his book, The New Evidence that Demands a Verdict, which attempts to prove the legitimacy, relevancy, and historical accuracy of the Bible. This book has itself become a "Bible" for fundamentalist Christians. What we learn from this video is that, apparently, McDowell is one of the main persons dismounting mummy masks. He states in the video that he doesn't know what he is doing and has to rely on what scholars tell him. [...] The scholarly community needs to be more and more aware of these practices, how these artifacts are being used, and the religious agendas behind it all". "God used our frail inabilities and worked with us. This isn't the Quran! See, this is the Bible, God working graciously through fallen people to protect his word". But the fallen people destroy antiquities. Roberta Mazza, 'Another Indiana Jones? Josh McDowell, mummy cartonnage and biblical papyri' Faces and Voices, May 05, 2014. There are many questions we would like Josh McDowell and the scholars collaborating to his project Discover the Evidence (Daniel B. Wallace of Dallas Theological Seminary, for instance, and Scott Carroll who are listed in the Discover the Evidence webpage as “Event Speakers”) to answer to the public: where do these mummy masks come from? Where did the dismounting process take place? Who are the other unnamed scholars mentioned in the course of the talk as taking part to these most extraordinary discoveries? 'First-Century Mark Fragment: Possible News', Earliest Christianity blog, May 05, 2014. Josh McDowell, the (in)famous Christian apologist, alludes to the Mark fragment (among others) in his discussion of retrieving manuscripts from ancient mummy masks. As has long been suspected, the fragment appears to be part of the collection owned by the Green Scholars Initiative. Peter M. Head said... "If these are ever properly published we may be able to evaluate some of these outlandish claims. In the meantime I think we should be clear that the processes described in this video are slapdash, deplorable and not reflective of good practice in Christian scholarship. For example in relation to the gold painted mummy masks he says 'we washed that gold right down the sink'...". Roberta Mazza, 'Papyri: It is a wild, wild life…', Faces and Voices, May 07, 2014. Absolutely horrifying. I just can't imagine anyone in their right mind doing something like this. I cannot imagine anyone in their right mind working with collectors. So who are these people and what do they want? Tide a Long Time in "Turning"
Sam Hardy's "Conflict Antiquities: the book"
Filming Starts Soon for Crook's "Detectorists"
"How Can we See the Treasure Act etc"? "and What's Wrong With That?" Coins Taken from University Excavation Archive? "So, He's a Lawyer Too", is he? CCPIA: Who Needs the Education? US Collectors: "OUR Spoils from Egypt"
They Dissolve Antiquities Don't They? Fifty-Shiftyism in the UK Farming Press? Ornithology Day - 'Archaeology' Day? "A Verdict on Josh McDowell"